Hood, Stephen M. John Bell Hood: The Rise, Fall, and Resurrection of a Confederate General (Savas Beatie, 2013). 384 pages, illustrations, maps, notes, bibliography. ISBN: 978-1-61121-140-5 $32.95 (Hardcover). Note: Also available in Kindle format. 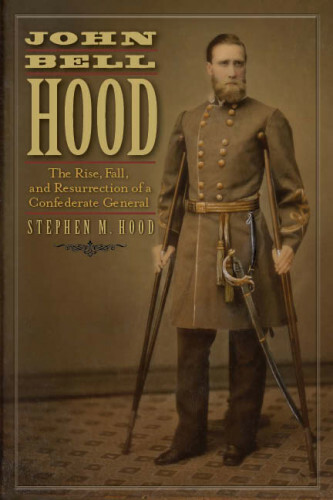 Note: The author, Stephen Hood, is nicknamed “Sam” Hood, as was General John Bell Hood. For purposes of clarity, this review will never use the nickname “Sam” to avoid potential confusion. John Bell Hood has been given an unfair reputation by 20th Century historians that in some cases borders on the bizarre. From the persistent claims of Hood’s laudanum use, to one author’s insistence that he fathered eleven children to prove his virility even in a crippled state, to Hood’s supposed bloodlust, this West Pointer has been thrown through the mud and back so many times he’s no longer recognizable. Stephen Hood, a distant relative of General John Bell Hood, has worked for many years to track down sources for these criticisms (when there are any sources) and then look at them in context and with a critical eye. The result is John Bell Hood: The Rise, Fall, and Resurrection of a Confederate General, an eye opening look at how small leaps of logic were latched onto and repeated through the years to warp the memory of a Confederate combat leader. Author Stephen Hood has been active in this fight for many years. He weighed in on Eric Jacobson’s book, For Cause & for Country: A Study of the Affair at Spring Hill and the Battle of Franklin, in many locations, including TOCWOC. Hood is in charge of the johnbellhood.org web site, where many of the ideas in his book originally took shape in one form or another. Hood has in the past served as a member of the Board of Directors of the Blue and Gray Education Society as well as President of the Board of Directors of Confederate Memorial Hall Museum in New Orleans. Time and time again, the widely “known” arguments against Hood, his laudanum use, his bloodlust, his denunciation of his troops as cowards, his preference for frontal attacks, are closely examined to track down where they originated. More often than not, the answer lies in one of the four books above. To make matters worse, many of these original claims are poorly sourced leaps of logic. And as a final insult, the authors above and others who used them as sources embellished the original “source” even more until Hood is a completely different man. There is no primary evidence of John Bell Hood ever abusing laudanum or alcohol. An early Ewell biographer made the laudanum claim with no backing data, yet does not make the same claim against Ewell himself. This is especially odd given that Ewell had an even more painful leg injury than Hood. Others picked up on that supposition and piled on until it has become cemented as “fact” by modern day Civil War buffs. This meme grew so powerful that a recent board game on Franklin has a die roll to determine how Hood is going to act on a given turn due to his laudanum addiction. In fact, General Hood was given morphine in carefully measured amounts after losing his leg by a surgeon who carefully noted these amounts day by day until Hood no longer needed the drug to sleep comfortably. Those notes are in Hood’s recently discovered personal papers. The way authors have embellished this myth is disgraceful. Even Hood’s sworn enemies like General Cheatham never accused Hood of being a drug addict or a drunk after the war, either publicly or in any letters found to date. Attacks on Hood’s character for being too aggressive, a gambler, and being insensitive to the death of his soldiers, among others, are examined in detail. In each of the cases above, the author either lays out why the sources for these allegations should be doubted or provides primary evidence which directly refutes these charges. His efforts are more successful than not. For instance, as regards his military ability, John Bell Hood’s recently discovered personal papers include personal letters of recommendation for promotion from “Stonewall” Jackson and James Longstreet. There is no primary source evidence of Hood being drunk, addicted, or sleepy on the night of November 29, 1864 at Spring Hill, a night where he and his army had a chance to trap Schofield’s Union army and capture large portions of it. ALL of these slurs occurred by writers in the 20th Century with no evidence to back their accusations. Stephen Hood takes an in depth look at Spring Hill and instead comes to the very plausible conclusion that Corps commander Frank Cheatham and division commander John C. Brown failed that night rather than Hood. Hood’s claims that Robert E. Lee “supported” General Hood for army command doesn’t hold up. At best, Lee was lukewarm or undecided as far as Hood’s suitability for independent command goes. Stephen Hood repeatedly makes claims, and I am paraphrasing here, that no one ever wrote that Hood <insert slur here>. Hood cannot make this statement in good faith because he cannot prove it to be true. It’s a minor irritant, but it detracts from the book. If he had written something like “after years and years of extensive research, I can find no evidence that anyone wrote <insert slur here>”, it would have resonated more with those of us who came into this book with healthy skepticism due to the author’s relationship to the general. While Stephen Hood’s defense of General John Bell Hood against the claim that he called his men “cowards” seems legitimate enough, reading Hood’s own words shows he didn’t have faith in their ability to attack at multiple points from Atlanta to Nashville. Stephen Hood points out that others in the AoT shared Hood’s opinion and that none other than Generals Lee and Sherman had similar doubts about their own commands at various points in the war. While all true, the areas of the book dealing with how Hood felt about his men seem lacking in some way. I may be mistaken, but it seems that only Thomas Connelly accused Hood of calling his soldiers cowards. Most others only state that Hood “doubted the valor of his troops”, to use Stephen Hood’s own words. It seems he did at some points, and there is nothing wrong with that. Some of the more minor issues in the book probably should have been left out. For instance, Stephen Hood claims that Joe Johnston’s performance in the Atlanta Campaign was generally approved by everyone on the Confederate side. That’s a pretty sweeping generalization to make. In any major army, you are going to find those both opposed to and for a given leader, no matter his performance. The Cassville controversy, where Hood had been slammed for NOT attacking (he can’t win, can he? ), seems to have simmered in recent years as Atlanta Campaign scholars agree Hood did the right thing based on the information he had at hand. Stephen Hood makes the dubious claim that John Bell Hood ordered only one frontal assault in his career as an independent commander, at Franklin. I would argue that he ordered at least three in his six major battles as commander of the Army of Tennessee. The author writes that Peachtree Creek was not meant to be a frontal assault. I disagree. It was meant to be a frontal assault, but against an unprepared enemy crossing a creek. The Battle of Atlanta a few days later did start as a flank attack, but portions of the Confederate line did assault breastworks frontally, and Hood was in charge. Stephen Hood absolves John Bell Hood of the blame for frontal assaults at Ezra Church and Jonesboro, stating the general was not on those fields. I admittedly do not know enough about Ezra Church to argue the point, and the author does seem to have a point at Jonesboro. Given the desperate situation, the Confederates had to do everything they could to prevent Atlanta from falling. Franklin was of course a frontal assault, and although the Confederates made a strategic advance on Nashville, they fought on the tactical defensive in the battle that followed. This is one of those arguments that no neutral party is going to 100% agree with. Hood saves much of his commentary for Wiley Sword, and with good reason. That author’s Embrace an Angry Wind, published in 1992 about the 1864 Tennessee Campaign, is filled with many of the questionable claims about John Bell Hood covered in Stephen Hood’s new book. For a few examples, take a look at a lengthy blog entry I published back in 2006 which compared/contrasted how Wiley Sword and Eric Jacobson looked at the Battle of Franklin. It becomes apparent that Sword quite often used information from Hay, Connelly and Horn in his book, never bothering to check their sources and embellishing already questionable claims. Though Stephen Hood never makes this claim in his book, I would argue that Sword’s book has done more to damage the reputation of John Bell Hood than every other source combined. Stephen Hood provides numerous cases where authors have used Sword’s more questionable claims in modern works focusing in some way on the Tennessee Campaign and the units involved. As Stephen Hood slowly unveils legitimate questions about Sword’s research time and time again, one begins to wonder what Sword’s goal was. Everyone makes mistakes. Let’s be clear. But the evidence seems to show that, if given the choice, Sword almost always picked the source which was the most negative to General Hood and ran with it, adding his own embellishments to the story. The ultimate example of this is Sword’s fanciful take on how Sally “Buck” Preston, Hood’s on-again, off-again fiancé back in Richmond, had a massive hold on every decision the man made during the campaign. In Embrace an Angry Wind, Sword discusses Buck Preston more often than three Confederate generals who were killed in the 1864 Tennessee Campaign! John Bell Hood: The Rise, Fall, and Resurrection of a Confederate General is an important new book that forces anyone with an open mind to begin reassessing what they think they know about John Bell Hood. Dubious origins and continued embellishment have created a version of John Bell Hood which never existed, and this version is the “standard” version of the man today. While some of the claims are overdone, this should not detract from some of the very valid points made about the use/misuse of sources without carefully evaluating these sources for their credibility and for agendas. Anyone interested in the late war Western Theater will find this a fine addition to their library. Those interested in historiography of the Civil War will find the book fascinating. Ties to General John Bell Hood aside, author Stephen Hood has produced a thought-provoking new book which should be judged by what is written. For any skeptics out there, it’s worth a purchase to form your own opinion on its merits, or lack thereof. 1. A couple of books (McMurray’s semi-bio of Hood, Castel’s book on the Atlanta Campaign) published in the last 25 years IMO did a lot to retrieve Hood’s reputation and I think they addressed the addiction issue. Does author Hood acknowledge this? 2. Ezra Church did feature some serious frontal assaults, but it is my understanding that they were ordered by the corps commander, Stephen D. Lee. 3. The addiction issue was treated at length in an issue of the magazine Blue & Gray. Does author Hood acknowledge this? 4. A point made in another discussion of this book: If Hood was not taking any pain medications, he almost surely would have been in near-constant pain from the amputation. (Ewell had issues with his leg in 1864.) Constant pain can affect one’s judgment almost as much as being on drugs. I know that this means almost that “General Hood can’t win,” but it is a fair point to bring up. Did author Hood consult with any docs to get their opinion on the amount of pain General Hood would have been dealing with? Good questions. I don’t have access to the book at the moment, so my replies are from memory. 1) Stephen Hood does mention both McMurray and Castel in a good light. He specifically mentions that McMurray had come so far as to remove any reference to a laudanum addiction in some of his later writing because he could find no primary evidence. 2) Stephen Hood’s comments are almost verbatim what you wrote here. He indicates that John Bell Hood wanted Ezra Church to be a flank attack, but that Corps commander Lee ended up disregarding Hood’s wishes and turned it into a bloody frontal attack. 3) To my knowledge, I do not recall any mention of Blue & Gray. I might be mistaken. When I have access to the book, I’ll look in the bibliography. 4) To my knowledge, author Hood did not consult with any medical professionals about the amount of pain JB Hood might have been experiencing during the Atlanta and Tennessee Campaigns. He does include some primary sources indicating that Hood got around much better and in seeming comfort than they would have expected given his injuries. There are also questions about how much use General Hood had of his arm, and it seems possible based on evidence that he made have had more use of it than is generally thought. Author Hood goes into great detail with primary sources to try to prove (fairly successfully, IMHO) that Hood was not impaired via drugs or alcohol or by being tired at Spring Hill and Franklin. Thanks for reading my book, and taking the time to write a lengthy and thoughtful review. I really can’t disagree with too many of your comments. My book covered a century of literature on a much written about character so I had many facts, assertions, truisms, myths, rumors, etc. to cover. As you rightly observe, I argued some of them more affectively than others. As I often say, my book is more of a study on the literature of John Bell Hood than Hood himself. Some of the historiography of Hood is solid, some not so much, and as you know, some of it downright deplorable. I tried to comment and provide primary source (where available) rebuttal on the historical orthodoxy of Hood. In response to Mr Epperson’s question 4, I did not confer with a physician on the specific issue of how much pain an amputee would have. I did however have access to the medical logs of Hood’s physician Dr. John T Darby that detail Hood’s Gettysburg and Chickamauga wounds, treatments, and recoveries. Hood was given no opiates for pain, rather, he was given small and carefully monitored does of “morphia” only at night, for sleep. He was weaned off of the morphia, and it was even noted that he was sleeping without it near the end of the log in late November 1863. Even in his 60 letters to his wife from 1869 through 1879, he never once mentions pain or pain treatment. And although he frequently mentioned social events [balls, etc.] he attended while traveling on business, not one time did he mention alcohol in any context. If Hood had pain it was never recorded by anyone (known,) and if he took pain treatment in any form–during or after the war–it was likewise never recorded, not even by him or his wife in their private correspondence. As profound as it sounds, there is no evidence that pain in Hood’s arm or leg was an issue with him. Is it possible? I don’t know. Thank for chiming in, and thanks for writing the book. It really was needed. As I mentioned to John below, I am looking forward to the Hood Papers’ publication. Positive praise where you think warranted, coupled with what you see as weakness in the book is a fair shake, and that is all a publisher and author can ask for. Thank you. As for the inquiries above, Steve Davis’s discussion is mentioned at length in the book (271-272, and cited in the notes, and bib including an essay he did on the subject in a collection edited by Larry Hewitt.) Dr Richard McMurry has now seen all the Hood papers, calls it one of the most important and remarkable finds in Civil War history, and has written the Foreword for the publication of the papers book, which will appear later this year. Thanks Ted for the clarification. I somehow missed the Steve Davis conversation. Brett: I have the book and I think your review is “spot on” in all respects. As for a bit of “overcompensation” by the author, i think that’s most apparent in the treatment of Lee’s assessment of Hood in connection with the July 17, 1864 replacement of Johnston. The book seems to make a numerical calculation of “positive” comments without any realistic consideration of context, the convoluted Victorian style of written communication, Lee’s dislike for confrontation, etc. I have always seen both of Lee’s letters as the old “backhanded:” compliment at best. What actually comes through loud and clear is that Lee would not have selected JBH for army-level command if it were up to him. To turn that into an affirmative reference by toting up what could be taken in a literal sense as “non-negative” statements is, I think, trying too hard. I also concur that the book is with the investment. Although others have already dismissed some of the stereotypes, such as the dubious “high at Franklin” and “JBH was po’d at his troops so he ordered a disciplining assault” theories, it’s useful to have many of the discredited assumptions laid out and done away with in a systematic fashion. I look forward to seeing the newly-discovered materials in the next book due out this year. You make a good point that I hadn’t really consciously thought about. Although some of these Hood myths have been debunked elsewhere, this book is very useful in that it is a “one stop shop” which pinpoints all of the dubious complaints against JBH in one place. Like you, I’m really looking forward to the new book on the Hood Papers. It’s an amazing find this far removed from the war. On the subject of opiates let’s remember, folks, that morphine doses (and just about everything else) were FAR in excess of anything that would be given today. Both medicine and knowledge of the effects of drugs (including addiction) were in what we’d consider a pretty primitive state. Point being, “carefully monitored doses” could mean just about anything. Mr. Ray makes a good point, and this is one of the reasons I’d like to get a doc’s opinion/assessment of Hood’s situation. If I may be so bold, this is something that might be useful to do for future publication, especially since the medical logs exist for a modern doc to look at and use as the basis for an opinion. Regarding Lee’s assessment of Hood, I only challenge those who say that Lee favored William Hardee for the job, and cite Lee’s 2 dispatches to Davis. Who knows, maybe Lee thought Hardee was the man for the job, but in my opinion historians shouldn’t cite the 2 dispatches to support that assertion. Lee had reservations about Hood, and stated them to Davis (along with praises,) but if all Lee had to say about Hardee was that he had managed an army (for 3 months during winter camp) I fail to see how that can be called an endorsement of Hardee. I don’t think Lee felt there were any great candidates to replace Johnston, and to be honest, I’d have to agree with him. Regarding opiates, I’m not plugging the upcoming Hood papers book, but I think you’ll be quite surprised at the judiciousness of Dr. John T Darby’s use of the “morphia” he gave Hood after Chickamauga. Like most people I had always been under the impression that 19th century doctors knew little of the long-term consequences of opiates, but it’s clear that Darby was very careful with the stuff. I have checked with some physicians and the dosages Hood received were generally what would be used today, although they commented that the purity and strength of the morphine used during the Civil War might have been different than today. In Darby’s log, EVERY dose Hood received was at night, and for sleep, because Darby would record the morphine’s effectiveness on Hood’s sleep. He started Hood with a lower dose, raised it after a couple of weeks, leveled off, then decreased the dosage, and finally, Darby recorded that Hood had been taken off the morphia completely. Maybe other Civil War era physicians didn’t recognize the problems with opiates, but it’s clear to me that Darby certainly did. Sam: I think you and I agree on Hardee. And Lee certainly did not worship at the Johnston altar. I’ve always thought, however, that if he’d been asked to survey the AofT roster and make a recommendation he may have come up with a couple of better alternatives. My point simply is that I think that his letters may appear to be far more enthusiastic about Hood at that level of command than Lee in fact was. For example, I have difficulty envisioning Lee choosing Hood for corps command (even given the other mistakes Lee made in that category, including a division commander who bore some similarities to Hood). As I indicated to Brett, I look forward to the papers book. Just finished the book. It exceeded my expectations. To be honest, I’m going to have a hard time hereafter reading anything by Wiley Sword without deep suspicions. To see the way that many of the original sources have been mangled, twisted, and subjected to interpretations that REALLY don’t fit the given context was eye-opening…and more than a little disconcerting. For my part, I had already revised my earlier views of “Hood the butcher,” at least in regards to everything but Franklin, before I had read Stephen Hood’s work. Now, even my earlier beliefs about that battle have changed considerably. To me, the strongest parts are the documentations of the failings of Sword, Connelly, et al (particularly their failure to at least mention alternate sources that favor Hood), and the continual double standard that has long haunted Hood vis a vis other Civil War generals. Less convincing is the assessment of Lee’s telegraph of July 17—already dissected above and in other posts—and, as Brett has mentioned, the rather thin “argument from silence” employed on a number of ococasion (although, I suppose, in all fairness, that’s simply the inverse of the practice of Sword and others in creating a number of things out of whole cloth, including dubious psychoanalyses of Hood’s strained courtship with Sally Preston acting as catalyst on his generalship). 1. The criticism of Kirby Smith’s failure to help Hood with a demonstration towards St. Louis (p. 190-192) is a bit too neat and pat for my tastes, making little allowance for the serious difficulties that Smith experienced in managing the Trans-Mississippi department as both a military area and, in many respectives, a political one. Lee at Petersburg and Hood in Alabama were overseeing areas that were geographically smaller, better connected in terms of infrastructure, and, arguably, in a better socio-political condition than “Kirby Smithdom.” Stephen Hood has a right to point out unfair comparisons of Hood with other generals, but it is disconcerting to see how he turns this rule on its head in instances such as this one. 2. Whle the full text of Hood’s April ’64 letter to Bragg does, indeed, seem to be rather unremarkable in tone, Stephen Hood has surprisingly little to say about Hood’s personal conferences with Bragg in mid-July, which is, as we know, another fairly significant strand in the “Hood the marplot against Johnston” mem. I wonder what his take is on this? 3. Finally, I was disappointed to find no mention at all of Kolb’s Farm. Though a minor engagement, it was, to some minds (rightly or wrongly), the tactical progenitor of Hood’s supposed “bloody” assaults at Atlanta. I suppose that Hood’s failure to mention the battle in his memoirs, as well as its limited strategic significance, made its omission likely. Still, this will be, almost certainly, ammunition for someone out there to use in a misguided criticism of Stephen Hood’s work for “conveniently” skipping over some parts of the general’s record. I eagerly look forward to the release of the general’s unpublished papers later this year! EDIT: Should be “Lee’s telegram and letter of July 12”. One other minor point: towards the beginning of Larry Daniel’s “Soldiering in the Army of Tennessee,” he makes mention of a complaint by Hood that his corps (the divisions of Stevenson, Stewart, and Hindman) was the weakest one in the AOT, a complaint that Daniel finds wanting. I don’t have a copy of the book on hand, but I’ve started to wonder about that claim. If anyone does have a copy and can check it, what is the citation? I’m starting to suspect that it may be one more example of a negative portrayal of Hood that has either been made up or doesn’t fit with the original source, but I want to be sure. Guitarmandanga, Thanks for the great review. The compliments are appreciated, as are the questions and criticisms, all of which are legitimate and well reasoned. I am fighting off the Mother of All Head Colds right now and will post a substantive reply to your review when the clouds in my head break and some sun pops through. In reply to your criticism of my presentation of the requests made by the Confederate high command to Kirby Smith to make a demonstration into Missouri to hopefully compel the return of AJ Smith’s troops from Nashville to St. Louis, I was simply providing information to readers who probably weren’t aware of the appeals to Smith. Richmond’s and Beauregard’s requests are rarely provided in books on the Tennessee Campaign, and even when mentioned, I’ve never seen the details I revealed. I tried not to flood the book with my personal analyses and interpretations, but to provide readers with primary source evidence that is rarely, if ever, included in books on Hood and his campaigns. I have no opinion on the feasibility of the concept of sending Smith north, nor do I know what his chances of success might have been. (I do however think that some attempt was justified, considering that Smith was told that the very existence of the nation might depend on his decision!) Whether Smith could have succeeded in reaching an area that would have compelled countermeasures by Grant I do not know. My primary intent in including the Kirby Smith material was to inform readers that Hood did not go to Nashville, simply fortify and await attack by a superior force, and nothing else—which is the common belief. You correctly point out that I did not say much about Bragg’s conferences with Hood in July of 1864. Bragg was sent by Jefferson Davis to Atlanta and met with Hood. What was said was said. Hood was among many Confederates—from senior commanders to privates—who were discouraged by Johnston’s perpetual retreating, and Hood said as much. Again I should point out that the theme of my book is not a campaign or command study, rather, an expose’ of the literature and historiography on Hood. Whether or not Johnston should have been relieved of command, and if so, by whom, I leave to authors of other books. I tried to mostly provide information that typically doesn’t appear in other books on Hood and his service with the Army of Tennessee. Kolb’s Farm? You got me on that one. There is little written about that fight, even by Hood’s critics. And you are correct that Hood wrote nothing about it. Why, I do not know. I can only say that in the 200 personal letters of Hood’s that I discovered in 2012, there wasn’t a word written about Kolb’s Farm by Hood, or by those who wrote to him. I know precious little about the battle. My admittedly weakly supported opinion is that Hood attacked Schofield’s wing of Sherman’s army, mistakenly thought the withdrawal of Yankee skirmishers was a general retreat, and advanced his troops into a deadly position. If you are alluding to the “controversy” being that Hood attacked without orders from Johnston, my opinion bank holds only the opinion of Ed Bearss, expressed to me personally at Kennesaw NBP in 2004. Ed said that Hood was sent to the Confederate left to protect the flank. As Schofield extended further and further to the south (Federal right) Hood had two decisions: to continue to move his corps further south to keep Schofield from turning Johnston’s left, or attack Schofield to halt his southerly extension. Had Hood not attacked, according to Ed, Hood’s corps would gradually separate itself further and further from Johnston’s main body. In summary, Ed said (and these are almost his exact words) ”Hood was ordered by Johnston to protect his left flank, and he followed orders–Schofield was stopped.” I again repeat: the primary intent of my book was not to be a campaign or command study. All I could have written about Kolb’s Farm is what Ed Bearss told me…not the best historiographical method. Hood lost every battle he ever fought. He was thoroughly outclassed by Sherman in the battles around Atlanta. Charged with holding that city, he failed to do so. He botched the Spring Hill affair–even if you want to pin that on Cheatham, well, Hood was the army commander and thus ultimately responsible. He then ordered an insane frontal assault over two miles of open ground at Franklin that wrecked his army. Having done that, he led his army on to Nashville where it was effectively annihilated, suffering the worst defeat of the war, coming as close as any Civil War army ever did to being destroyed in the open field. He was a terrible general. This revisionism is baffling. Nothing in your reply has much of anything to do with the book under discussion. It is a monograph about the HISTORIOGRAPHY on Hood, and the sources used by OTHER authors to describe and detail Hood’s military (and to some degree, postwar) record. In other words, you did not read the book. I agree that commenter Vidor seems to be passing judgment on the book without having read it. Furthermore, his comments strongly suggest that he didn’t even read Brett’s review.